Read the finalized compilation report of 6th SEA Junior here. Photo is of the team at arrival airport location, being addressed by Mr. K. There were about 40-50 plus proud parents and friends receiving them at the airport. Picture courtesy of James Wong. Congratulations to our SEA Junior athletes, in their best ever showing for the Championship with four gold, three silver and five bronze medals, plus breaking five age group records. 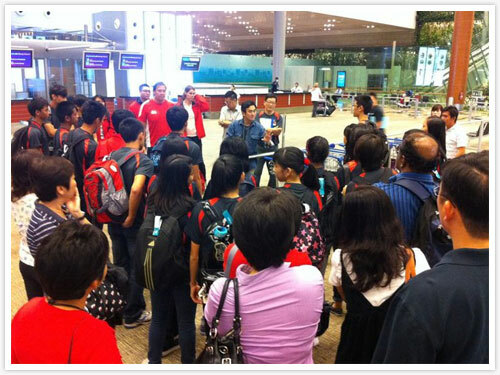 Sending-off for our Team Singapore, SEA Junior contingent earlier today at the airport. Present is SAA President, Mr. Tang Weng Fei, parents, officials, coaches & the athletes themselves. Do the nation proud. Photo courtesy of WeiDe Toh. 2011 SEA Junior is to be held between 17-18 June 2011, at Jakarta, Indonesia. Singaporean youth and junior athletes born in 1994, 1995 and 1996 (15 to 17-years-old) who meets the below qualifying standard will be selected. Download the qualifying standard in PDF Downloaded [download#482#hits] times.